The Blitzen shoe covers are a fairly simple affair — a windproof, fleece-lined bootie with an open bottom and Velcro closure along the back to secure the bootie over one’s shoes. The cuff and toebox include neoprene; the former to help protect against cold and the latter to offer better sealing (and a little stretch) to the ankle area. The bottom is open and in reinforced with a rubberized coating. There’s a sewn-on “strap” of sorts to help hold the two sides of the bootie against the shoe inside. This opening also allows the cleat system of your choice to poke through with no interference. There’s also a smaller opening at the heel to allow the sole to poke through. 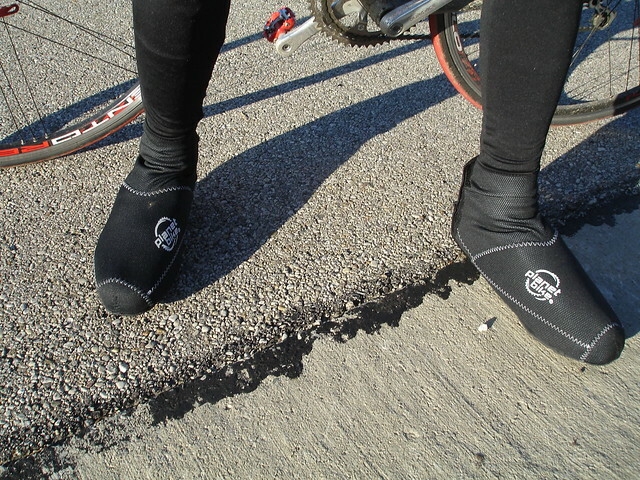 This protects the shoe covers’ fabric from being worn away if you find yourself walking instead of pedaling. The shoe cover material only has a tiny bit of stretch in the main body, so shoes with aggressive knobby soles can be a tight fit. My Adidas MTB shoes were a bit of a squeeze getting into the size “L” (the Blitzen covers come in sizes S through XXXL, but the site doesn’t indicate exactly what shoe sizes those letter designations actually cover). Once snugged on, there is no excess material flapping and everything was tight to the shoe. Regular “street shoes” may or may not fit within the Blitzen shoe covers; I would imagine something low-volume might fit, but you’d have to try your own shoes to see for sure. 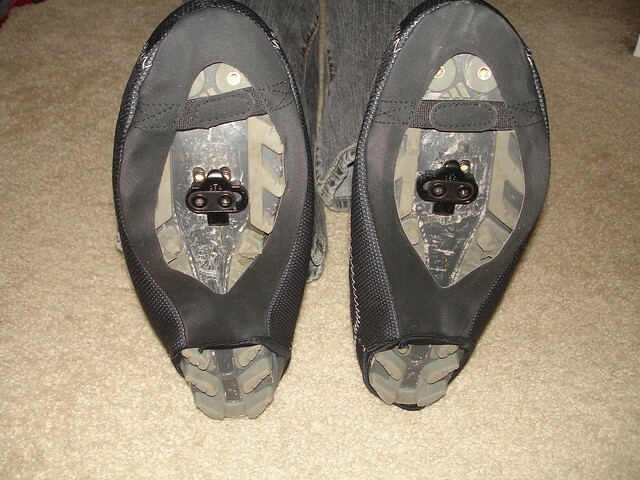 These covers are designed for cycling shoes, not “universal fit”, and if you don’t wear cleated cycling shoes, there may be better cover options on the market out there for you. 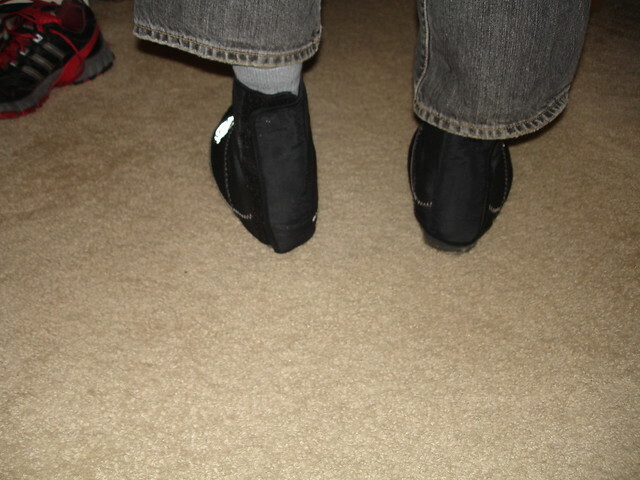 One thing I discovered is that with shoe covers having an open bottom, wind and cold can enter around the cleat area. The metal cleat and screws can transmit cold right to a sensitive part of one’s foot. My quick remedy for that was remove my shoe’s insoles, then I cut squares of felt to cover the cleat interface from the inside and taped it all down with a couple layers of duct tape. BOOM! Cold transmision conquered! The covers are not waterproof, but they shrugged off some of the rain I experienced. After longer rain rides, my shoes and feet got pretty wet, but for the shorter stuff it wasn’t too bad…a little dampness here and there that I could live with. I wore these covers down to around 12 degrees, and while they didn’t keep my feet toasty warm throughout, the cold they DID let through was bearable. For me, the low temp for these covers is around 20 degrees…lower than that and I really wished for something more insulated. Not everyone can afford (or needs) a pair of Lake or Sidi winter boots, so these Blitzen shoe covers offer some of the benefits of a dedicated winter cycling shoe without the astronomical price. The Blitzen shoe covers retail for about $45.00, and serve best as a good cover for moderately cold, mostly dry conditions. 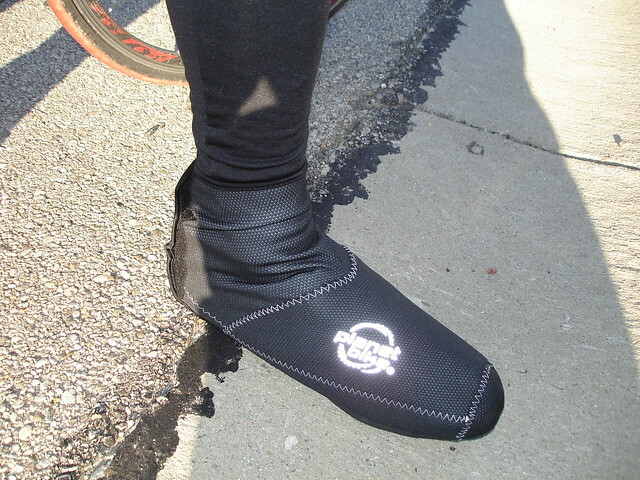 If you need more insulation, Planet Bike also offers a full neoprene shoe cover called the Comet. I am so glad Planet Bike took pity on me and offered to let me test both the shoe covers and the Borealis gloves…they made my first real winter in over 20 years a bit more bearable — thanks, PB!!! As always, Planet Bike offers a wide range of products for all types of cycling. Swing on over to their website to take a look for yourself! 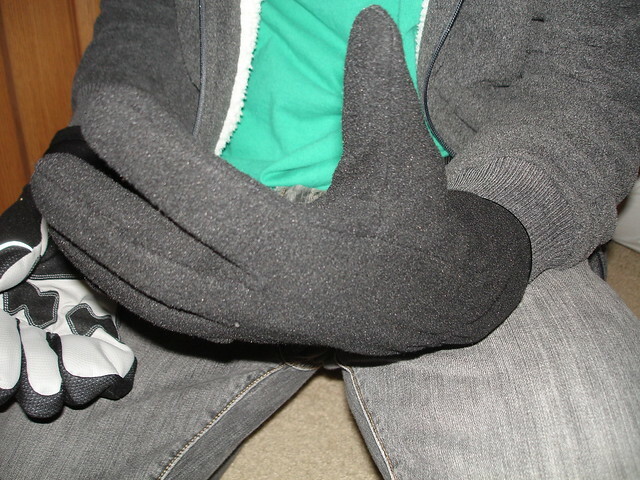 Feature-wise, these gloves have a lot going for them…good reinforcements on the palm, a generous (and soft!) 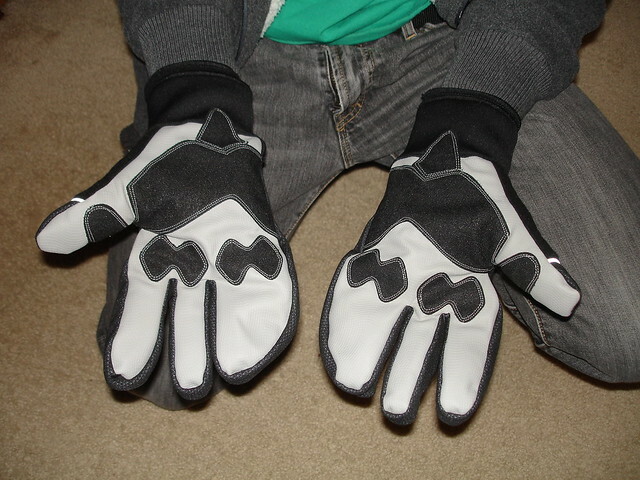 nose-wiping area on the thumbs, a neoprene cuff and simple closures that did a really good job of sealing out chilly drafts. And, despite their seeming bulk, I had no trouble manipulating the brake and shift levers on any of the bikes I ride. Even the small thumb-lever on Campagnolo Ultrashift levers was no trouble. 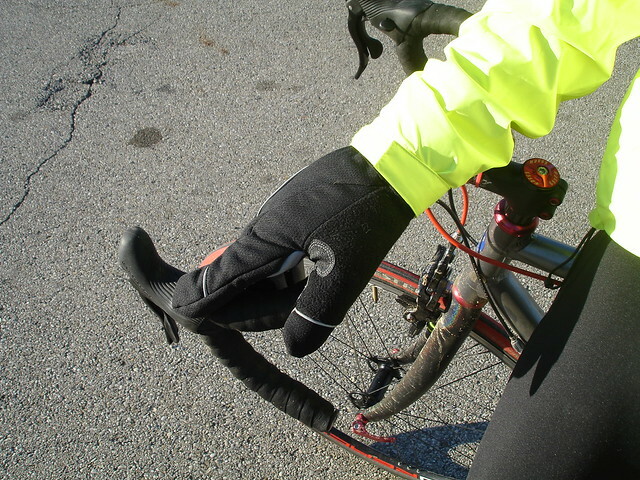 Seeing as how this was my first time with lobster-style gloves, I was pleasantly surprised to discover that these gloves really didn’t interfere with the operation of the shifters as I had feared prior to riding with them. The grey piping on the gloves is highly reflective, so the Borealis gloves are a good choice for nighttime riding or when extra visibility is key. 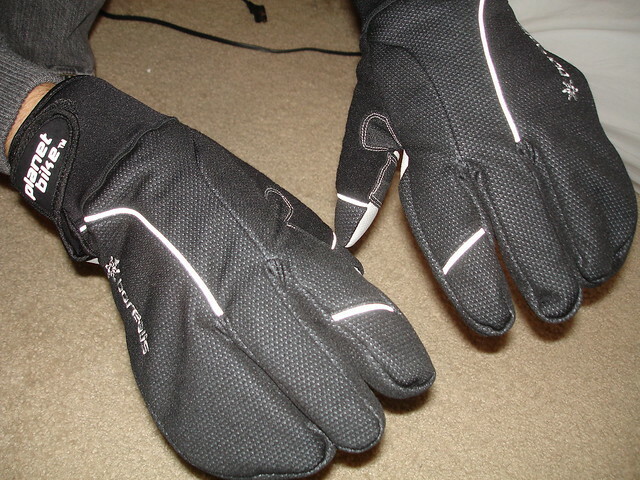 Although these gloves are not fully waterproof, they fended off most of the rain and spray from my rides. If you’re heading out into a downpour, however, there may be better choices in gloves for you…something with a vapor-permeable waterproof liner and taped seams. As far as temperatures go, I was comfortable down to around 10 degrees F…with temps in the teens, I could get about an hour of riding before my fingers started to tingle with cold, but below that, I would have to invest in hand-warmer packets, pogies or something else to keep my digits warm. At a retail price of around $42.00, these gloves are a pretty smart choice for cold-weather commuters. The Borealis gloves are substantially less expensive than other similar “lobster” gloves, yet have most of (if not all) the features in those pricier gloves. And, of course, Planet Bike has you covered for other protective gear and accessories, no matter what season you ride in. Swing on over to their website to take a look. 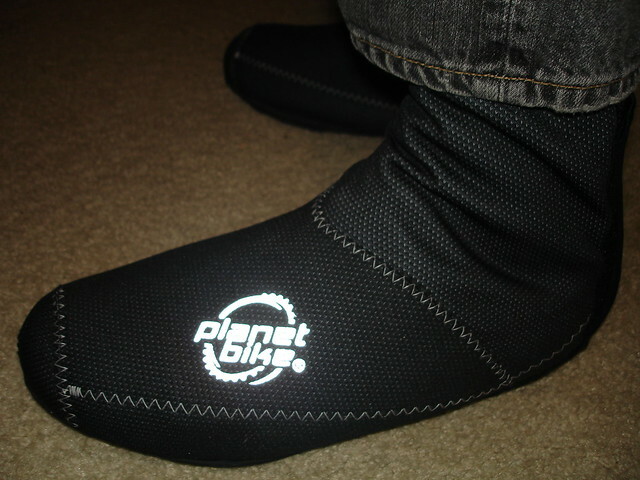 Coming up later in the week, we will be reviewing some cold-weather shoe covers from Planet Bike. Stayed tuned for that! We’ll be putting these goodies through their paces over the next couple months…it’s already gotten quite chilly here, with low temps in the 20s and highs of only the mid-50s. Having lived in Florida for the past two decades, I was woefully underprepared for truly cold-weather riding, so these Planet Bike items will hopefully keep me toasty as I test them out. Stay tuned for reviews — I am hoping to try these items out in the snow, if possible.